I even got crafty with presents this year. It’s pretty addicting once the crafty ball gets rolling and I hoped they’d have more impact than going out an purchasing something. 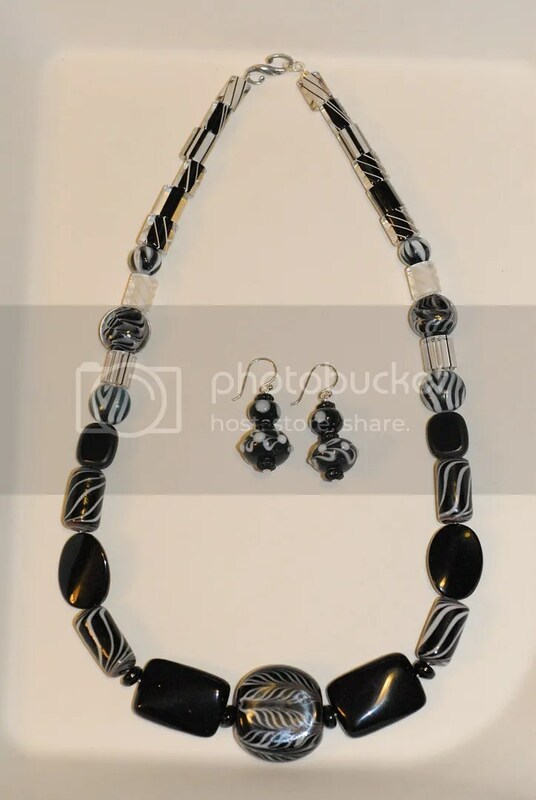 My mom really loves black and white jewelry and it’s often really hard to find. So I scoured bead stores and the jewelry sites I frequent to find a bunch of different choices. 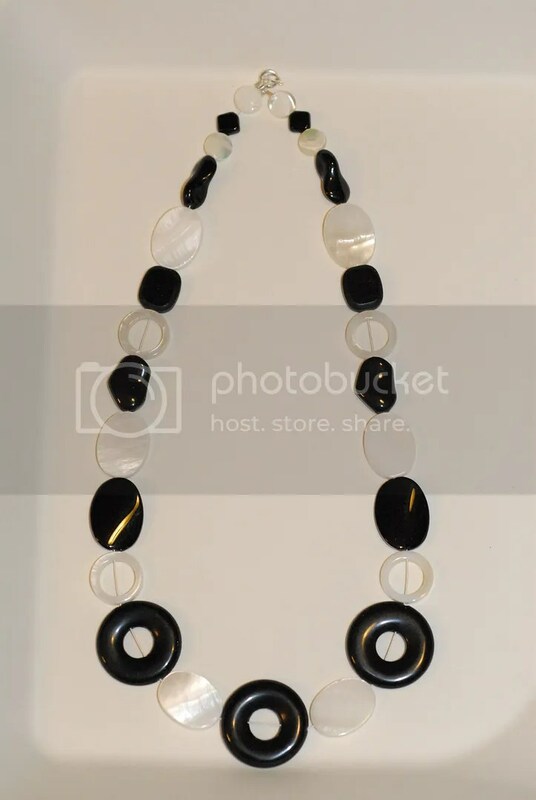 Then I looked through her necklaces to find the lengths she likes and got to work. Along with the three necklaces, I made two pairs of earrings. 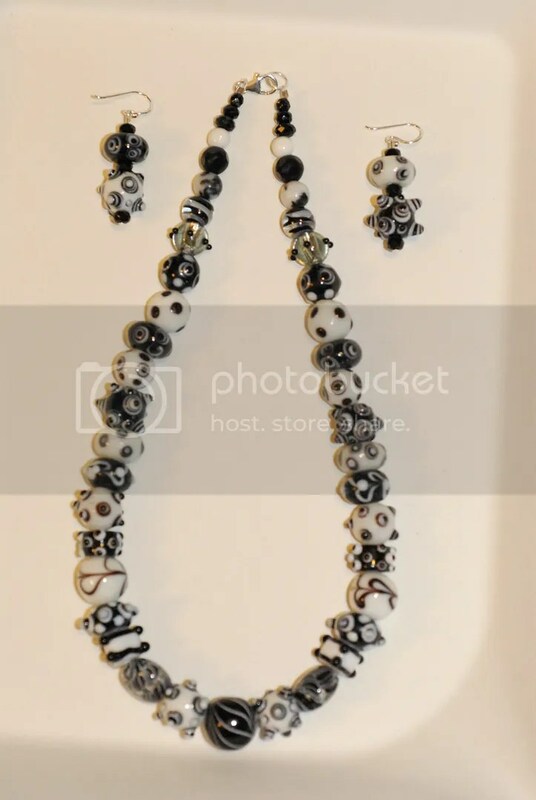 She had a great suggestion to use just one bead on the earrings (she prefers 1/2″ earrings) so the earrings in the picture are actually just the base bead now and look pretty cool like that. The photos are a smidge blurry, but you’ll get the gist. 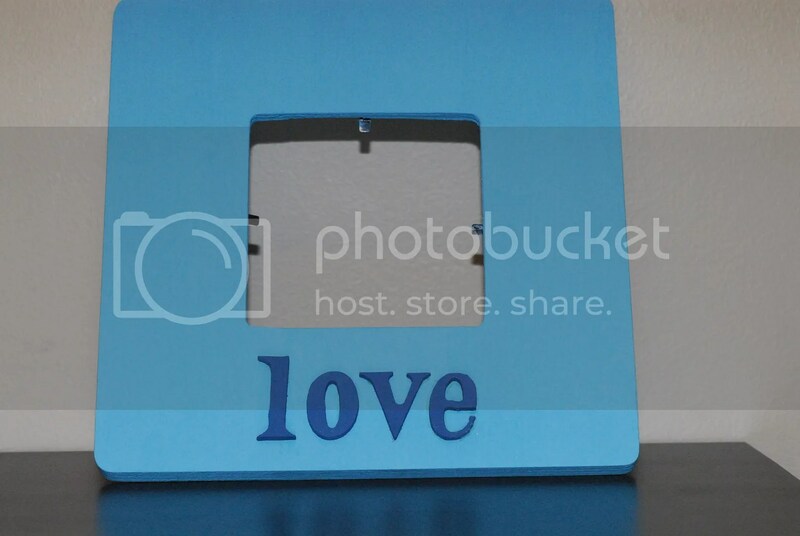 Continuing on with the woodwork, I discovered picture frames and letters. I found making these to be another hypnotic activity. Plus they allowed me to combine my photography with another creation. Both of these had photos I took in them when I gave them. I also made another for my dad that said, “L’amour” with a photo of my mom. I even went so far as to make the apostrophe myself by cutting up the tail of a “j” and sanding it down. I forgot to photograph it though since I finished the frame at my parent’s house. I never took a photo of the finish product but just imagine a Stormtrooper and a Roller Derby Girl and it all comes together. My brother’s girlfriend is an absolutely wonderful baker and I scoured Etsy to find something for her since I knew I wouldn’t find anything in the mainstream arena that was unique. I saw an idea that I really liked and decided to make it myself. 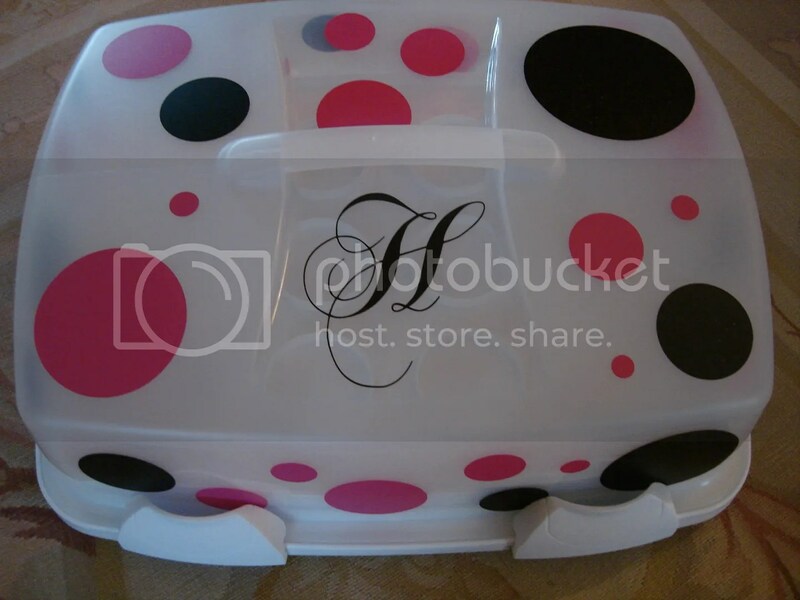 These cake/pastry carriers are popular now and the Etsy idea of personalizing it seemed pretty cool. Yet another Google search led me to a company that makes vinyl dots of many different sizes and colors. I picked out a couple of sheets of dots, bought the “H” from another Etsy seller and grabbed a carrier at Michael’s. A million dots later, I realized that working with vinyl is not as easy as it looks! I learned quickly that an elaborate font like the one used for the “H” is NOT for a beginner and thanked my lucky stars that the first one actually looked pretty great (the mangled second one was quickly replaced with dots). Second, vinyl grabs air pockets like nobody’s business so my first strategy of slapping on the dots meant for lots of bubbles. And while using a credit card to flatten them is a great trick, some dots are just too far gone, especially if they’ve got pull marks at the edges if I had to lift up the dot to start over. My last mistake was that I bought two different sheets of stickers: one of them had 12″ dots down to 2″ ones and the other 3″ down to smaller than 1/2 and it looked really uneven as the only ones I could use from the black sheet were a bunch of 2” and 5” and none of the pinks were 2”. Take two, I purchased two of the same sheets 5″ down to 1/2″ and then made a much more cohesive yet still random pattern. Some of the big ones from the 1st attempt were still on it and I think they made nice additions to the random pattern. And I put them on correctly, of course.So, with the second round of dots actually working, I happily gave this to her. It’s probably good she didn’t witness the yelling during the first round, though! My most exciting project was my present for my brother. He’s a big Stormtrooper fan. His friends went as far as to purchase him one of the official (and super badass) Stormtrooper suits that he dons on Halloween (hence the photo mentioned above). Personally, I’d also wear it to the office, but that’s just me. 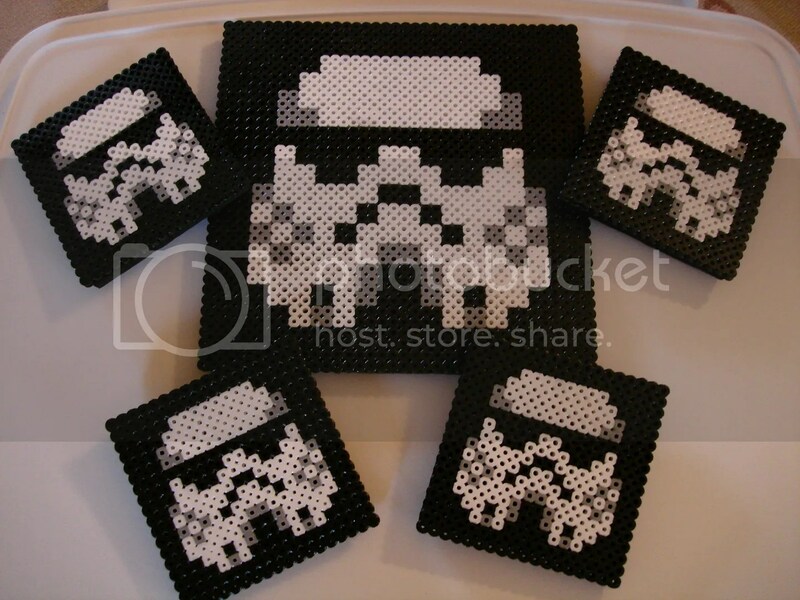 So, I always keep an eye out for great Stormtrooper items but he has a lot of them and there are only so many obscure tshirts out there, plus he’s not 5 so he really doesn’t need any toys. I came across the next item in another (dare I say it) Google search. 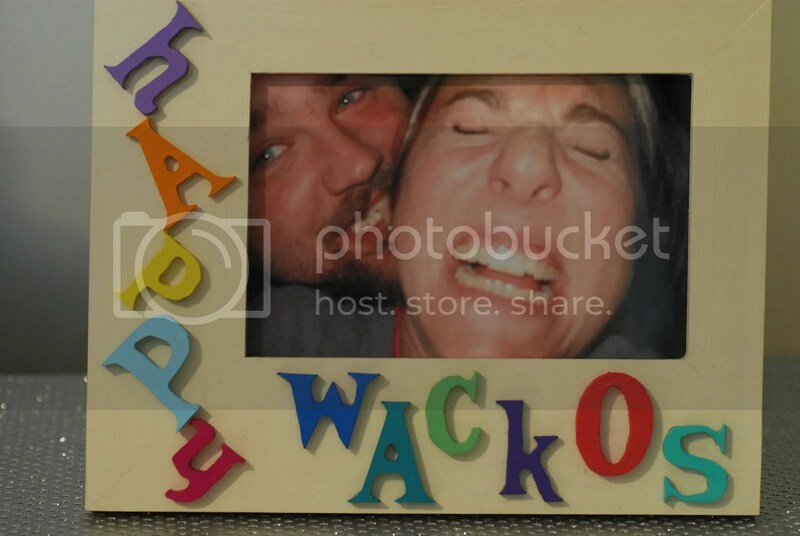 It was a captured image from an Etsy seller who had sold these years ago. Hmmm, can’t buy them for him. Wait a minute! Michael’s! So, I researched fuse beads and found out they are used by kindergartners across the nation. Perfect! Just as an FYI, it is almost impossible to find grey in a store and in the stores near me, I couldn’t even find black or white alone. So, after I ordered special boards for the trivet (the Etsy designer only made coasters so math oozed its way back into my projects when I added the trivet) and the colors from Michael’s online, I was good to go. To seal them, you iron them while covering them with ironing paper. Obviously, the kindergartners don’t do this part. And a heads up, they go from sort of clicky and still separated to super melty (bad!) super fast. The other thing that I did, that the guy did not, was add a foam backing. Now, they’re about 3/4″ and won’t slide all over the place. I am so exciting about these!!! And that was Christmas in our house!